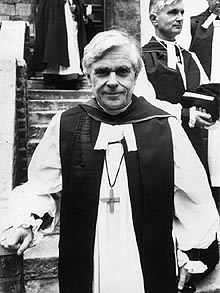 The Right Reverend Stephen Verney, who died on November 9 aged 90, was an unconventional Bishop of Repton, in the diocese of Derby, from 1977 to 1985, and during the 1960s played an important part in the development of the vibrant church life that sprang from the consecration of the rebuilt Coventry Cathedral. A deeply spiritual man and a courageous thinker, Verney was essentially a romantic for whom a life of high ideals was also one of high adventure. And he found ample scope for the expression of this during the Second World War, the final years of which he spent as a member of the Political Warfare Executive (PWE), a sister organisation of the Special Operations Executive (SOE), working underground with Greek guerrillas on German-occupied Crete. When the war started Verney had not long left Harrow and was reading Greats at Balliol College, Oxford. At that time he was an ardent pacifist and, having been registered as a conscientious objector, had enlisted in a Friends’ Ambulance Unit. But as the war intensified and the Nazi campaign became demonstrably more evil, he changed his mind and joined the Army, beginning as a private in the Royal Army Service Corps. This took him to Egypt, and it was while attending a party in Cairo that he happened to meet his former Harrow headmaster, Paul Vellacott, who was by then director of political warfare Middle East. Aware that Verney was a classicist who could easily master modern Greek, and that – despite his aristocratic family background – his shortness of stature and often scruffy appearance might enable him to pass for a Greek peasant, Vellacott persuaded him to join the PWE. After initial involvement in black propaganda from Cairo, he was commissioned, and in August 1944 – disguised and accompanied by a German Jewish interpreter – he was dispatched by night to Crete in a small boat. His primary task was to sow seeds of disaffection in the German occupying army. On landing he was met by a Cretan “guardian angel”, who recruited a few others to form a cell under Verney’s leadership. They targeted German soldiers who rejected the Nazi regime, others who had fallen in love with Cretan girls, as well as Austrians, Poles and other nationals who had been unwillingly dragooned into the German army. Verney and his team operated from an informal base outside Canea – home to the headquarters of the German commander in Crete. A printing press was set up in a cave and run by a Cretan journalist who published a propaganda news-sheet in German and Greek. This conveyed the false impression that the resistance movement was very large and that the occupation forces were cracking under the strain. Verney wrote frequently to the German commander, General Benthag, to point out that his situation was now hopeless and that “Kapitulation” was the only sensible choice. A graffiti campaign using the letter K was launched, with the aid of local boys who painted it on walls, bridges and sentry boxes. Acid was used to etch it on the windows of military vehicles. On his own initiative Verney was responsible for the mass desertion of Italians who had been fighting with the German army. Having made a number of indirect contacts with their colonel, he crept, disguised, into the camp hospital. The meeting was conducted with Verney stretched out on an operating table, the colonel hunched by him as if hearing his confession, while another officer played the part of a surgeon. On May 8 1945 General Benthag formally, but secretly, surrendered to one of Verney’s fellow-officers; and that evening the small group of British officers in the area invited the German officers who had been hunting them to a party in a café. A jazz band from the German garrison was pressed into service, and during the festivities Verney and the others disclosed their code names and true identities to their astonished guests, among whom were some of the most detested men in the occupying army. All were immediately taken prisoner. Verney’s exploits in Crete were recognised with a military MBE. He returned to Oxford in 1946 to complete his degree, and, having been drawn by his wartime experience to seek Holy Orders, went for training to Westcott House, Cambridge. He was ordained in Southwell Minster in 1950 and after a two-year curacy at Gedling, near Nottingham, embarked on a ministry that was rarely conventional and ended with his becoming a bishop of an unusual sort. Stephen Edmund Verney was born in Anglesey on April 17 1919. His father, Sir Harry Verney, 4th Bt, held a number of junior ministerial posts in the Edwardian era and won a DSO in the First World War. On completion of his Gedling curacy, where he had found traditional church life deeply frustrating, Stephen Verney was appointed priest-in-charge of the new housing area of Clifton, outside Nottingham. When he arrived in 1952 it was inhabited by 2,000 people, mainly living in council estates. By the time he left, six years later, their number had risen to 20,000. It was a soulless place, poorly planned, with no playgrounds for children or community buildings. Verney described it as “a social desert” and gathered a small congregation together for Sunday worship in a builders’ canteen, where rats ate the heart out of a harmonium. Meetings were also held for lonely mothers; there were clubs for young people and those over 60; and he convened a regular meeting of professional social workers to deal with some of the problems. In his own planning of a new church building, the strong romantic side of Verney’s nature took over. Greatly inspired by the example of St Francis of Assisi, who had built a church with his own hands, he felt moved to have the church in Clifton erected by the labour of himself, members of the congregation and anyone else, including undergraduates on vacation, who would lend a hand. A willing, if somewhat sceptical, architect produced a simple design and, amid some excitement and much publicity, work began. The digging of foundations proved to be no problem, but as the building progressed the absence of essential skills became more apparent. Drains and other elements in the building had to be corrected and the project began to absorb an inordinate amount of Verney’s time. The final stage of the building was completed by professionals, and the church was dedicated in 1952 in honour of St Francis, with Verney as its first vicar. The experience of the next six years had a formative influence on him, but it took a toll on his health, and in 1958 he moved to Coventry to become diocesan missioner and vicar of the small country parish of Leamington Hastings. This was no rest cure. Basil Spence’s new cathedral was rising, phoenix-like, from the ashes of the old, which had been almost completely destroyed by wartime bombing. An enthusiastic new bishop, Cuthbert Bardsley, was assembling a team of gifted clergy to develop a vibrant Christian life both within and without the soon-to-be completed building. The slogan: “A consecrated building requires a consecrated people” was adopted to describe a three-year period of preparation for the great day of the cathedral’s reopening, and Verney was entrusted with the project in the diocese. He was ideally suited to this assignment, combining an organising vision with deep spirituality to enthuse his flock. Throughout Warwickshire there were meetings and missions in every parish, prayer cells were formed, a clergy conference was held at Balliol, and 10 days of mission services addressed by the bishop in Leamington parish church. A cross, formed of nails taken from timber rescued from the ruined cathedral, was passed from parish to parish and made the focus of prayer vigils. By the time the new cathedral was ready for consecration on May 26 1962, the diocese was in a state of high expectancy and, although the preparatory campaign had been a team effort, Verney’s leadership was a vital factor. In 1964 one of the residentiary canonries of the cathedral fell vacant, and Verney was appointed to it, with another project in sight. The 50th anniversary of the foundation of the diocese was due for celebration in 1968, and it was decided that, instead of repeating the kind of festivities that had surrounded the consecration of the cathedral, there would be an international conference on “People and Cities”. This would celebrate the benefits of urban life, but also confront the huge problems of depersonalisation caused by the scale of modern cities. The Coventry conference was opened by the Duke of Edinburgh, attended by 150 specially-invited participants from all parts of the world, and addressed by planners, philosophers and theologians. Then-current assumptions were challenged, and some of the conference’s proposals eventually led to new approaches to urban planning. In his book on the event, People and Cities (1969), which was partly descriptive and partly made up of the papers given by the speakers, Verney argued that the future of the Church’s work in cities lay in the formation of small groups, what he called “companies of forgiveness”. Having spent 12 years in Coventry, mainly on two major projects, it was felt that Verney should be given the opportunity to share what he had learned with the rest of the Church. He was therefore appointed to a canonry of St George’s Chapel, Windsor, in 1970. Since the duties of this office were less than arduous, Verney was free to pursue his many other interests, but he had overlooked the degree and extent to which St George’s Chapel is controlled by tradition and protocol – to both of which he was decidedly opposed. He argued instead for the introduction of contemporary worship with modern music. But the Dean, Bishop Launcelot Fleming, himself a moderate reformer, found himself trapped between Verney and another recently-recruited canon on the one hand, and, on the other, two dyed-in-the-wool colleagues who had been at Windsor for many years and were resolutely opposed to any suggestion of change. This, together with a sharp clash of personalities, did not make for a happy capitular body. Relief came in 1977 with Verney’s appointment to the suffragan bishopric of Repton in Derby diocese. As anticipated, he proved to be an unusual bishop – never short of a new idea and seizing every opportunity to encourage the formation of small, informal church groups. His strong pastoral gifts were used to the full and, as director of post-ordination training, he enjoyed a close, supportive relationship with younger generations of clergy, often surprising them by his impatience with the institutional life of the Church and his radical proposals for its reform. His ideas found expression in three more small books – Into the New Age (1976), Water into Wine (1985) and The Dance of Love (1989) – all of them a combination of romanticism, vision and insight. His retirement was spent at Blewbury in Oxfordshire, and he was an honorary assistant bishop in Oxford diocese. His first wife, Priscilla, died in 1974, and in 1987 he married Sandra Bailey, who survives him with a son and three daughters of his first marriage. A son of his second marriage predeceased him. According to scientists’ estimations, the wall paintings in the Canaanite palace in Kabri are a conscious decision by the city’s rulers who wanted to adopt the Mediterrenean culture rather than the Syrian and Mesopotamian art styles adopted by other cities in Canaan.